Products can be brands or own label, and must be available to buy in store or online to Irish/Northern Irish consumers by 24th October 2019, except seasonal items such as Christmas, Easter, Mother's Day etc. For the Fresh Produce categories only, products must be on sale in outlets at any time during 2018 or 2019. 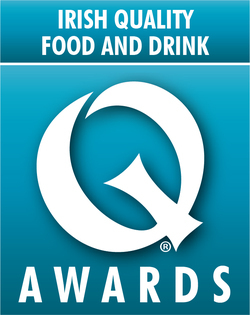 Entry is not restricted to new products; products previously entered into the Irish Quality Food Awards are eligible for re-entry. No entry cancellations will be accepted or refunded after 19th June 2019. Any pack photo submitted as part of the entry process may be used by MPI Media for marketing purposes. Small producer criteria: any business with fewer than 10 staff and annual sales no greater than €1 million is eligible for the small producer fee. Please note: The Irish Quality Food Awards will not be held responsible for correcting company or product names that have been submitted incorrectly. Price includes drinks reception, three-course dinner, table wine, entertainment and awards presentation. Cancellations: You are welcome to substitute any guest(s) at any time. There will be no refunds on any cancellations received after 1 October 2019. To enter the prize draw users must have an active Twitter account, follow @IrishQFAs and re-tweet (RT) our original competition message on their own Twitter account during the competition period. Only @IrishQFAs followers will be entered in the draw. The Twitter username of the winner may appear on our website or on social media.